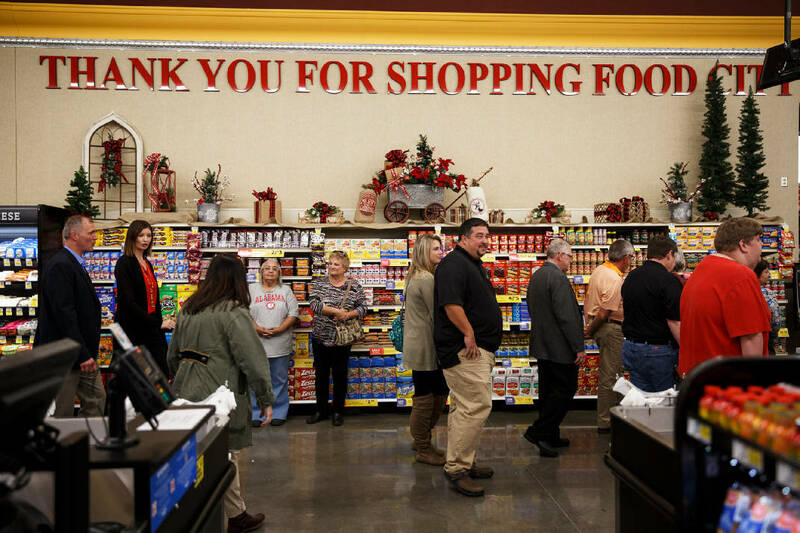 People tour Food City's new Mission Ridge Road location during its grand opening on Tuesday, Nov. 6, 2018, in Rossville, Ga.
Terry Beard says he has been driving about 14 miles to a grocery store while waiting for a new Food City supermarket to open just four blocks from his house. "I was sick of going to Fort Oglethorpe," said Beard, who with his daughter, Gracie, were among 150 people who took part in a ceremony Tuesday marking completion of the new $8 million Food City on Mission Ridge Road in Rossville. The 38,000-square-foot supermarket, which opened for business at 8 a.m. today, replaces a nearly 50-year-old store that Food City acquired when it purchased 29 Chattanooga area Bi-Lo units in 2015. Rick Bishop, Food City's executive vice president for the Chattanooga region, said the old store was just 22,000 square feet in size. He expects sales to increase sharply from the older unit. For example, he said, the new store has 150 frozen food doors compared to 50 in the old unit. Also, the new supermarket employs 125 people while the old one had about 50 workers, Bishop said. "It means a lot to be able to continue to grow," he said. "It meets the needs of more customers which is what we want to do." Daryl Massey, Food City district manager for the Chattanooga-North Georgia area, said the modern store will help the company "keep up with the times." "Food City has delivered," he said. Among features in the new supermarket are an in-store bakery/deli, a hot food bar, and an expanded cafe and seating area. Also, it offers full-service meat and seafood departments with pre-marinated and seasoned oven-ready products, according to Food City. In addition, the new store has expanded grocery, frozen food and produce departments along with a pharmacy. Additionally, a Food City Gas N' Go was built adjacent to the store. Steven C. Smith, Food City president and chief executive officer, said in a statement that the Mission Ridge area residents have supported the company. He said the grocer is "excited to have the opportunity to provide them with a new, larger, much improved Food City to replace the former outdated facility." Walker County Commissioner Shannon Whitfield cited the turnout on Tuesday, adding that it "shows how much the community will support this store." Lacey Wilson, the Walker County Chamber of Commerce president, said she posted the store opening on Facebook and it soon received more than 260 shares. "It's a great opportunity to keep dollars local in Walker County," she said. In addition to the Mission Ridge Road unit, Food City is currently building new stores at 540 Highway U.S. 41 in the Ringgold, Ga., area and at 1308 W. Walnut Ave. in Dalton, Ga.
Smith said earlier this year that the three stores the grocery chain is building in Northwest Georgia are part of up to $60 million that Food City is investing into the Chattanooga market.